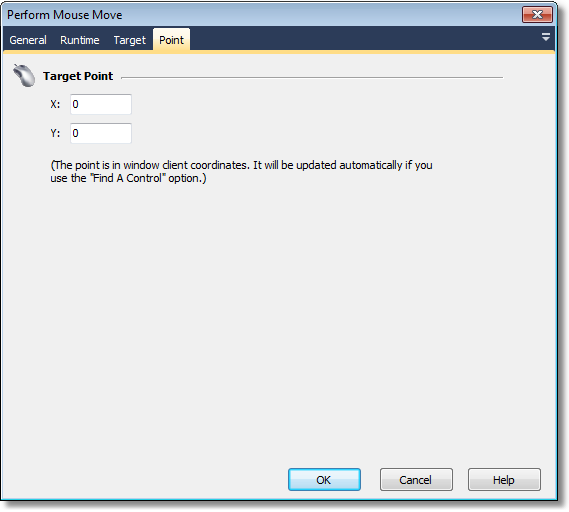 Use the Perform Mouse Move action to move the mouse to a specific point over a control. This action can be used if you need to hover the mouse over a target control in order for something to happen. Note: It is not necessary to use Perform Mouse Move each time you use Perform Mouse Click. Use the Target Property Page to select the window or control for the mouse to hover over. Note that sometimes it may be necessary to work around the automatically detected control, if the control pops up at the target point after the mouse has moved there. Choose the target point for the mouse to move over. The point is in client coordinates of the control window. Using the "Automatic Configuration" option on the Target page will automatically fill these fields in with the mouse position. To hover the mouse for a specific amount of time, use the "Pause after Run" option on the Runtime property page.